Lark-Horovitz (4th from left) with Karl Meissner (3rd), Randall Whaley (far right) and others. The problem of reconverting Purdue's physics department to peace-time activities, following more than four years of delivering specialized academic programs for the military and of wartime research--most of it classified and thus unpublishable -- was indeed formidable. In contrast to the way research in physics was carried out in wartime, programs relevant to the war in engineering and other sciences, such as chemistry, biology and medicine, were divided up and assigned to numerous research and academic institutions throughout the U.S. Thus the staff and the programs of these institutions were strengthened so that after the war they were in a position to utilize the manpower and research equipment that became available after the war. Physics research relating to the war, on the other hand, was mainly carried out at four locations: MIT, the universities of Chicago and California and of course, Los Alamos. Thus, at the end of the war, many physics departments, including Purdue's, found themselves depleted, both in equipment and personnel, whereas those at the four institutions mentioned above had grown to the extent that they became the primary centers of research in the then current fields of physics. For Purdue's physics department, it was difficult not only to purchase the equipment necessary for carrying out research, but also to compete for the services of physicists in the post-war seller's market. Furthermore, Purdue's comparative pre-war reputation--despite its many successes--was not such as to attract top physicists and Lark-Horovitz's reputation as a "tyrant" discouraged most from even considering Purdue. Some of the young luminaries of Purdue's prewar staff, notably Julian Schwinger and Robert Sachs, did not return after the war and it was very difficult to find replacements of their caliber. Purdue's department was particularly hard hit by virtue of its having moved into the new physics building a few months before Pearl Harbor. After the U.S. entered the war, it became virtually impossible to obtain even the minimal office and storeroom equipment to say nothing of the equipment needed for carrying out research. The situation was so bad that even normal amenities, such as electric lights were not available in all offices and laboratories and in many instances people had to do their best with makeshift equipment. Thus, the first task of the department following the war was to make the physics building habitable to students and to obtain and install, or repair, laboratory apparatus so as to provide facilities for undergraduate and graduate student training. Once the rebuilding process was underway the department could again begin to think seriously about its two main research programs: (1) the research on semiconductors that had become dominant during the war; and (2) the natural extension to higher energies of the nuclear research that during and before the war had been centered on the cyclotron. With the war ending, many of the important contributors to the germanium research switched back to or turned to other fields: Seymor Benzer to biology, Hubert Yearian to electron diffraction, and Randall Whaley to designing an electron synchrotron, and to departmental administration. R. Smith left for Boeing in Seattle to avoid allergies prevalent in Indiana, and only Ralph Bray continued with research on semiconductors and went on to receive the Ph.D in 1949 for his work on the "spreading resistance". Gradually, under Lark-Horovitz' not always gentle prodding, a variety of Purdue's pre-war research programs were resurrected: nuclear physics research, (centered around the Van de Graaff accelerator and the cyclotron); x-ray and electron diffraction; atomic spectroscopy--under the leadership of Karl Meissner, who had come to the department in 1942; and cosmic rays. The move to the new building in 1941 had necessitated the painful process of transporting the 60 inchcyclotron from the old building. It had been subsequently modified and installed in the new building by a skeleton crew for war research purposes, to a 0.5-1 MeV machine and taken over by the Manhattan Project in early 1942. It was used for classified work for a period of time and then abandoned when King and Schreiber and most of the members of the cyclotron staff moved to Los Alamos in 1943. 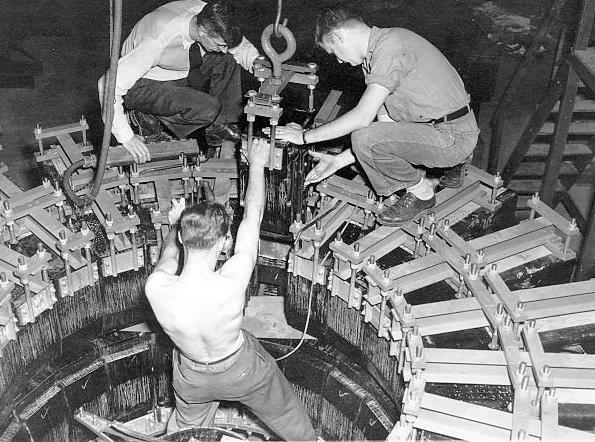 The cyclotron was then out of use until after the war when it was necessary to bring it back up to 10MeV to make it again useful as a research tool in nuclear research. In the X-ray and electron diffraction laboratory, there were also transition to peace-time problems. Some of the equipment had never even been unpacked following the move to the new building! Moreover, in the interim a number of technological innovations had taken place, and various new devices, such as automatic recorders, had to be installed in order to achieve a competitive edge with other researchers. The biophysics effort was also hampered by lack of laboratory space. A laboratory had been planned on the third floor of the new building but, unfortunately, this floor was occupied by the U.S. Navy and was not immediately accessible until a year or so after the war. Severe transition difficulties were also encountered by the spectroscopy group. For example, diffraction gratings which had been ordered before the war were delivered only late in 1945! Despite these and other "inconveniences", the department, within a few years, had dug itself out and was carrying on research at even a more energetic level than it had before the war. Under Lark-Horovitz' guidance the department's professorial faculty expanded four-fold from 11 professors (3 full, 6 associate, 2 assistant) in 1945 to 36 (13 full,13 associate, 10 assistant) at the time of his death in 1958. With the help of this expansion several new cutting edge research programs were begun. One of these was initiated by Professor Foster Rieke following his joining the faculty shortly after the war. Under Rieke's guidance, a 2.5-MeV linear accelerator was designed and constructed. Its energy range was subsequently extended to over 6 MeV. One of the important projects carried out on this accelerator was by the graduate student, William Miller, who under the guidance of one of the new faculty members, Robert Platzman, carried out studies of electron multiple scattering in nuclear emulsions. When Rieke left Purdue in 1954, his student John MacKay--who joined the faculty in 1955--used the accelerator to continue a long standing program of studies of radiation damage in semiconductors. It [this project] promises to provide equipment to release atomic energy on a scale not available at the present time and will lead to a better understanding of the interaction between radiation and matter and the constitution of elementary particles. For this work a special grant of $10,000 was set aside for preliminary construction and an additional $25,000 will be necessary to make a model which will reach energies at which transmutation of matter will take place. It is our hope and belief that should this first model work successfully, national organizations will be interested to support this research on a large scale and provide finally a machine which will produce cosmic rays in the laboratory. Haxby, Matthews and an unidentified student during the construction of the synchrotron. The accelerator was constructed during the ensuing four-to-five years but initially received little if any support from outside the University. Its eventual cost was approximately $150,000 for materials plus additional moneys for labor. It received significant and increasing outside support from the Atomic Energy Commission beginning in 1950 and continuing on for the rest of its useful life. By the late 1950's, it was supported by an AEC contract at a level which, although not large in comparison to funding received by other meson producing accelerators such as those at Cornell, Cal Tech and Illinois, established the synchotron as the largest single source of research support at Purdue. When the project was finally completed and the synchrotron was totally operational in 1952, it produced a useful beam of 300 MeV electrons. Under appropriate circumstances, by cutting down the beam intensity, this could be increased up to 330 MeV. Thus the synchrotron operated at a substantially higher energy than the minimum one required to produce pi mesons, which according to the Yukawa theory and subsequently confirmed in a variety of ways--were the particles via which the constituents of nuclei, that is neutrons and protons, exerted forces on each other. The electrons, of course, were not used directly to produce pi mesons but instead were accelerated to their high energy, caused to smash into a target--usually of tungsten or some other heavy material--and the gamma rays that came out were above the threshold energy of about 150 MeV necessary to produce pi mesons. Professor Haxby's interests were mainly in high energy accelerator design; nevertheless, he constructed a pulsed-field closed chamber for use with the synchrotron and he and several graduate students used it to conduct studies of the photo-disintegration of various nuclei. A few years after the synchrotron became operational, Haxby went on leave to MURA (Midwestern University Research Association) in Madison, Wisconsin to help in designing other high energy accelerators. The faculty involved in carrying out experiments on the synchrotron were Robert Haxby, Thomas R. Palfrey, Jr. and George W. Tautfest (who died in 1966) and later also by Frank J. Loeffler. The latter three (assisted for a few years, O.E. Johnson and Ben Neflzens) formed the nucleus for a significant high energy physics group in the department that eventually grew to constitute one third of the department's faculty. The machine itself produced interesting and useful experimental results until about 1963 when new particle accelerators, which were capable of producing pi mesons more efficiently than the synchrotron, appeared on the scene. At that point the machine was taken out of service. The high energy experimentalists Loeffler, Palfrey and Tautfest then turned their attention to experiments at accelerators at national laboratories, including those at Brookhaven, and Stanford--and much later at Fermilab as well as at the large accelerators in Germany (DESY), and at CERN in Switzerland. Another Purdue alumnus who gained later notoriety in nuclear physics was Chia Hsein Teng-a high-school classmate of Nobel Laureate Chen Nin Yang - who came to the department as a graduate student from mainland China and received a Ph.D. at Purdue in 1950. His thesis research dealt with the photo-disintegration of the deuteron and was carried out under Frederick J. Belinfaute - and Dirk TerHaas. Following his return to mainland China in the early fifties, Dr. Teng assumed major responsibility for the Chinese atom bomb project. He headed up the theoretical group of the Chinese counterpart of the Manhattan Project and in effect played a role in that project similar to that J. Robert Oppenheimer had played earlier in the American version. The semiconductor research effort at Purdue in the post-war era was one of great transition and immense growth, and of progress and diversification, even though it started quite inauspiciously. As was already mentioned, the interests of most of the participants in the semiconductor program switched to other fields soon after the end of the war. This exodus produced a significant drop in the momentum of the departmental semiconductor program, but this was followed by an explosive growth which was due to several factors. (1) The post-war recognition of the importance of semiconductor research generated greatly enhanced financial support from government agencies. Even though Purdue had a considerable head start because of its accomplishments during the war, semiconductor physics programs were initiated in most Universities and at many industrial laboratories, including Bell Labs, General Electric, Westinghouse, RCA, Sylvania, I.B.M., Xerox and Raytheon. The industrial focus on semiconductors promised an important future job market and significantly influenced the flow of students into the semiconductor field. (2) Purdue's track record in semiconductor research enhanced the reputation of the Physics department. That factor, combined with timely and aggressive recruitment at home and abroad by Lark-Horovitz, brought a large number of new faculty members, post-docs and graduate students into the department. S. Benzer and R. Bray finished their doctoral work at Purdue, and became staff members. Benzer, as mentioned above, soon switched his interest to molecular biology and left for fellowships in Oak Ridge, California and Paris before returning to Purdue to help start a molecular biology group, initially in the Physics Department. Bray left for a fellowship in Delft, Holland and returned to pursue his interest in the physics of transistor operation. The new research staff included Hsu Y. Fan from China (after a brief interlude at M.I.T.) who quickly provided both experimental and theoretical leadership in semiconductor research, and Piet Keesom and Lex Gerritsen from the University of Leiden, who set up a low temperature (liquid helium) laboratory. There was an influx of post-docs who contributed greatly to the program at Purdue; some stayed on and others eventually left to assume very important leadership roles either in this country or in their respective homelands. The most significant contributions came from Chao-Shena Hung from China (via M.I.T. ), Hans Frederickse from Holland, Ralph Hudson and H. Gebbie from England, and Wolfgang Kaiser from Germany. In addition there arrived a host of students who eventually went on to make important contributions to Purdue, and later in various industrial laboratories and Universities. The high point of the post-war years and the greatest factor in the expansion of the semiconductor field was the discovery of the transistor in December 1947 at Bell Laboratories. A group that had been established there at the end of the war by W. Shockley was dedicated to the invention of a semiconductor triode amplifier. The attempt to understand and overcome the failure of Shockley's initial design culminated in the serendipitous discovery of the point-contact transistor by John Bardeen and Walter Brattain. Although the transistor discovery generated only minor excitement at first, its ultimate evolution into computer chips containing millions of transistors generated the technological revolution of the present era. As noted in the 1941-45 report,(1) the various achievements in the war-time semiconductor work at Purdue played an essential role in the discovery of the transistor. The story of the discovery and its relationship to Purdue is told in a paper by Ralph Bray(2) entitled: "A Case Study of Serendipity; Why Was the Transistor Invented at Bell Laboratories and Not at Purdue University." The initial attempts at Bell Labs to make a so-called "field-effect transistor" involved the use of silicon. This effort failed but promoted a program to overcome this failure. At a critical stage in his work, Bardeen suggested a switch from silicon to germanium. This suggestion was influenced by his knowledge of the properties of germanium as determined at Purdue. In fact, the experiment in which the point contact transistor was discovered was made with a germanium sample supplied by Purdue! The relevant earlier work at Purdue included the development of the high back voltage diode and the discoveries of the anomalous properties of germanium by Benzer and Bray. These helped shape the experiments at Bell Labs which led to the unexpected discovery of the point-contact transistor. Benzer had discovered that there existed a natural potential barrier at the surface of n-type germanium, independent of any contact which was responsible for the rectifying properties of the diode. This work strengthened Bardeen's faith in his conception of the presence of surface states and their role in the failure of Shockley's initial design of the field-effect transistor. It was in the subsequent attempts to overcome the presence of the surface states that the transistor was discovered. Bray discovered the anomalous behavior of the resistance in the conducting or forward direction of the germanium diodes. The forward resistance was found to be lower than expected by factors of 10 to 100. In addition, pulsed current-voltage measurements revealed a hystersis effect, a delay of several microseconds for the resistivity to decrease after the onset of a voltage pulse and a similar delay in its recovery to normal as the pulse fell. These effects turned out to involve the basic physical mechanism by which the transistor operated. The hysteresis effects were due to the progressive accumulation in the sample of the minority carriers as they were injected from the appropriate contact and drifted into the sample, followed by the recombination of the excess electron-hole pairs during the tail-end of the voltage pulse. The concept of minority carrier injection and its significance became apparent only after the Bell Lab announcement of the discovery of the point-contact transistor in July 1948. Bardeen and Brattain were aware of the ongoing research at Purdue and its relation to the operation of the transistor. They expressed their concern "that maybe the Purdue group would also think of the transistor, and so were anxious to publish as rapidly as possible to get priority for the discovery". They need not have feared. Whereas the Bell Lab group had been deliberately set up to develop a transistor, there was no similar commitment in the earlier work of the Purdue group. The significance of the anomalous properties discovered at Purdue, which might have suggested the possibility of making a triode transistor, was not fully appreciated, in part because the wartime exigencies enforced a narrow focus on making better diodes. It is interesting that the group at Bell Labs was fully informed on all the semiconductor work at Purdue through Purdue publications, reports at meetings and discussions with visitors from Bell Labs. However this candor was not reciprocated. The work at Bell Labs on the transistor was a tightly held secret until its public announcement in mid-1948. Thank you for your nice letter of November 2nd. It clearly gets the highest score for the number of signatures of old friends of any of my congratulatory letters. I am also especially pleased to receive this expression of good will from the group at Purdue because I feel grateful to you and to them in connection with being awarded the Nobel Prize. In some cases it seems to me that the prize has been awarded on the basis of a single isolated brilliant accomplishment. In other cases, I believe the award is influenced by the general contribution made to the field. Certainly the work at Bell Telephone Laboratories was influenced in many ways by work at Purdue University, and I am sure the reverse was true as well. I thus feel that contributions from Purdue, especially those referring to work of my colleages and myself, contributed in important way to our position in the field. I would like to express my gratitude to you and your colleagues. One anecdote I heard from John Bardeen deserves mention here. In 1947, after Bardeen and Walter Brattain had discovered transistor action at Bell Laboratories using a point-contact electrode and germanium, and while their success was being kept confidental during the filing of the patents, they visited Purdue as guests of the physics department there. Lark-Horovitz, still deeply involved in the study of germanium said to them in effect: "There must be some way in which we can make a triode from these semiconductors. Do you have any suggestions? Coincident with the discovery of the transistor, was the growth and diversification of the semiconductor research staff. Although a good part of this diversification was initiated by Lark-Horovitz, much of it was the consequence of important discoveries both at Purdue and in other laboratories. The diversification of the program can be illustrated by identifying the areas of most significant achievement which made this era a truly exciting one. Bray discovered the complement of excess minority carrier injection, namely, minority carrier extraction whereby the intrinsic population of minority carriers, present in thermal equilibrium in pure samples at elevated temperatures, could be completely extracted from the sample. This discovery completed the understanding of how minority carrier population could be controlled by varying the nature of the electrical contacts to germanium. In addition, Bray and Fan initiated a program of studying the modes of recombination of non-equilibrium electron-hole pairs from measurements of the lifetime of minority carriers. The knowledge and control of the lifetime is a critical ingredient in the efficiency of transistor operation since it determines whether carriers injected at the emitter can effectively reach the collector and thus generate the amplified signals. In the course of studying—with his student Milton Becker—photovoltaic effects at p-n junctions naturally occurring in some germanium samples, Fan made an extremely important discovery. The story and its consequences are fascinating. Fan worked out a theory for the magnitude of the photovoltaic effect which turned out to give a very good fit to the data. But then he began to wonder why his theory worked at all after he realized that he had innocently made the assumption in his formulation that the incident light penetrated uniformly throughout the depth of the sample. The wonder was due to the fact that the common notion at that time was that light was strongly absorbed very near the surface of incidence. Finally, Fan and Becker set up an experiment to measure the actual penetration of light and discovered, to their great surprise that the light, which generated the electron-hole pairs and was responsible for the photovoltaic effects, was only weakly absorbed and did in fact penetrate through the depth of the sample. Thus this was the start of years of study at Purdue and elsewhere of the structure of the absorption spectrum in different semiconductors and its use as a tool to determine the complexities of the energy band structures in various materials. Fan was involved in another interesting example of the conflict between initial expectations and the complexities of nature. Having discovered that germanium was quite transparent to photons at energies well below the intrinsic absorption edge, he began to wonder about the magnitude of the absorption by the free carriers. Initial calculations for absorption by free electrons indicated that such absorption should be much weaker than was actually measured observed. This discrepancy was finally explained by the realization that the effective mass of the carriers in the semiconductor must be a factor in the magnitude of the absorption. An effective mass less than the free electron mass should enhance the absorption. Cyclotron resonance measurements, undertaken elsewhere, confirmed that the effective masses of carriers in semiconductors was very dependent on the energy band structure and generally quite smaller than that of free electrons in space. Henceforth, optical studies of energy band structure and impurities and of photoconductivity, led by Fan, became a very important and permanent part of the program of the semiconductor group. The Signal Corps, which for a long time provided the post-war financial support for the semiconductor program, objected to the optical studies on the grounds that only electrical measurements were relevant to the interests of the Signal Corps. How wrong they were!! Optical studies proved their importance for understanding the properties of semiconductors, and were a very rich source of technological applications. This work was expanded to include not only germanium, but also indium antimonide and tellurium. It is to the credit of Lark-Horovitz that he fought ferociously any attempt to restrict Purdue's work in this area. He was also instrumental in expanding the semiconductor crystal growth facility (primarily through the devoted work of Louise Roth) for supplying the whole research group, on demand, with good single crystals with controlled doping of various semiconducting materials. Lark-Horovitz started a program of using semiconductors to study the nature of radiation damage by nuclear particles. Eventually, a host of graduate students were involved in studies of damage by electrons from the van de Graf generator, protons and alpha particles from the cyclotron, and neutrons from reactors at the national laboratories. Several of the graduates of these studies (MacKay and Klontz) eventually became members of the physics faculty at Purdue. At the request of the Lark-Horovitz, Fan became actively involved in organizing the research and analyzing the results. A prime effect of the bombardment was the creation of defects with energy levels deep in the forbidden band. Hubert James initiated an attempt to understand how deep energy levels could exist. The study of deep impurity levels, not only due to the defects created by nuclear bombardment, but due to various impurities such as gold and copper, became an important subject of study in various laboratories. Another important contribution of neutron bombardment was its ability to controllably create impurities with shallow energy levels by transmutation of germanium. There were several interesting examples of the development of germanium devices. Lark-Horovitz assigned a student (Ed Simon) to work on photovoltaic solar cells, and Ben Gossick and Jim Mayer developed nuclear particle detectors which were small enough to insert into the brain for making nuclear scans. High resistivity germanium was developed elsewhere as a very sensitive and quantitative device for analyzing gamma ray spectra and was used by Madam Wu at Columbia University in her memorable demonstration of the non-conservation of parity. When she gave a seminar on this work at Purdue, she publicly berated the Purdue nuclear physicists in the audience (Steffen and Bleuler) for not having taken advantage of the semiconductor work here to apply this device to their own work. The low temperature laboratory built by Keesom and Gerritsen in a quonset hut adjacent to the Physics building, developed a life of its own and provided the tutelage for a large number of students and post-docs; for example, Norman Pearlman in specific heat studies and impurity band conduction studies successively by Chou Hung, Rajat Ray, and Hellmut Frizche. Chou Hung made the first observations and interpretation of impurity band conduction at very low temperature as a process of hopping of bound carriers between the randomly arrayed shallow impurities. The mechanism of hopping conduction was a stimulus for many theoretical studies both for semiconductors and much later for theoretical analyses of conduction in disorganized materials (glasses), a subject for which Mott, Anderson and Van Vleck later received the Nobel prize. Hung and Ray went back to China and India, respectively, while Fritzche had a very distinguished career at the Univeristy of Chicago. Frederickse, in his study of the thermoelectric power in germanium at low temperature, discovered an anomalous contribution which he attributed to a drag of the free carriers by acoustic phonons. This work stimulated various studies of the phonon drag effect for years in related circumstances in many laboratories. Lark-Horovitz and V. Johnson discovered the onset of degeneracy of free carriers at sufficiently low temperatures, when the free carrier contribution to the electrical conductivity was governed by Fermi statistics in contrast to Maxwellian statistics at higher temperatures. A memorable incident in the late 50's demonstrated Lark-Horovitz's character and personality. While hospitalized in Chicago, he still was active in running the department by having various members visit him to report on their activitites. At one point, Lark-Horovitz's doctor told him to avoid too much activity, warning him that he would get ulcers. Lark-Horovitz is reported to have replied: "I do not get ulcers; I give ulcers!" In 1958, Lark-Horovitz received the honor of being invited to give the opening plenary address at the Third International Conference on the Physics of Semiconductors scheduled to be held in August in Rochester. Unfortunately, he was unable to give his address. A short time earlier, in April, he suddenly took ill after having given a lecture and died in his office in the Physics Building. That was the sad ending to a very important era in the Physics department. The growth in the size of the faculty and in the number of research projects at Purdue was particularly spectacular after the war. 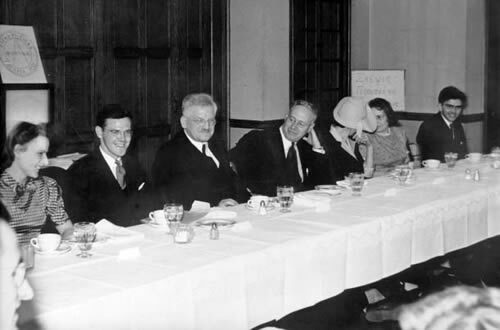 At the end of the war in 1945, the faculty of the department faculty consisted of eleven professors: three full professors (Hubert James, Karl Lark-Horovitz, and Karl Meissner); 6 associate professors, (Edward Akely, Robert Haxby, Foster Rieke, Isador Walerstein, -Withrow and Hubert Yearian) and two assistant professors (Vivian A. Johnson, and -Risser); plus 15 instructors among whom wereSeymour Benzer, Ralph Bray, Ralph Lefler, Donald Tendam and Randall Whaley. By 1950, the number of professors had more than doubled to 23 with: 6 full professors (now including Ernst Bleuler, Isador Walerstein and Hubert Yearian); 10 associate professors (now including Frederick Belinfante, Hsu Fan, Irving Geib, Vivian A. Johnson, -Mullins, Robert L. Platzman andRandall Whaley) and 7 assistant professors (now including Seymour Benzer, Ralph Bray, Hudson, Piet Keesom, Ralph Lefler, Rolf Steffen and Donald Tendam) plus three visiting professors: (Binnie, Chang and Hsieh). By the time of Lark-Horovitz's death in April 1958 this number had again nearly doubled to just under 40 professorial faculty with 14 fulls (now including: Edward Akely, Frederick Belinfante, Hsu Fan, Robert Haxby, Vivian A. Johnson, Piet Keesom, David Peaslee, and Rolf Steffen); 10 associate professors (now including Kenneth Andrew, Binnie, Ralph Bray, Irving Geib, Alexander Gerritsen, Richard King, Thomas Palfrey, Norman Pearlman, Masao Sugawara and Donald Tendam); and 13 assistant professors (now including Robert Buschert, Peter Fisher, Solomon Gartenhaus, Orland E. Johnson, Everet Klontz, Frank Loeffler, John MacKay, Ray McCleod, John Radavich, Richard Smith, Robert Stanley and George Tautfest). From this point on the department continued to expand; it reached its maximum size in the early 1970's of 62 professors. S. Gartenhaus and A. Tubis, "The War Period, 1941-1945", in this series on the web and in Purdue Physics, Vol. 5, No. 1, Fall, 1997. Ralph Bray, "A Case Study in Serendipity", The Electrochemical Society, Interface, Spring 1997. Frederick Seitz, "Research in Silicon and Germanium in World War II", Physics Today, January 1995, p. 26. Quoted in, V. A. Johnson, "Karl Lark-Horovitz, Pioneer in Solid State Physics", Pergamon Press, (NY) p. 45.